Today, this condition is known as Thygeson superficial punctate keratitis (TSPK). It is a chronic, often bilateral, recurring illness, with relapses over years to decades. 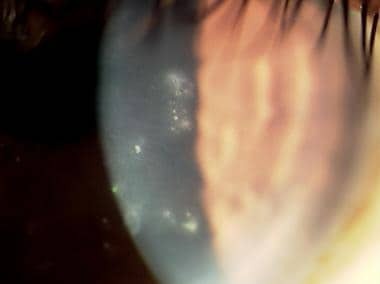 Multiple, whitish gray, intraepithelial corneal lesions, with minimal to no conjunctival involvement, are trademark characteristics of the disease. Although TSPK has a genetic association with HLA-DR3, controversy exists regarding its exact etiology. Artificial tears, topical corticosteroids, topical cyclosporine, and therapeutic soft contact lenses are the typical treatment methods for the disease, and the success of these treatments varies according to the severity of the disease. Although vision may be mildly decreased during the active disease, the long-term visual prognosis is excellent. The cornea of a 33-year-old African American man with active Thygeson superficial punctate keratitis (TSPK). A review of the literature suggests the pathophysiology of TSPK remains unclear, although viral and immunogenic components are both likely in the disease's formation. The frequency of TSPK in the United States is currently unknown. The worldwide frequency of TSPK is unknown. TSPK does not cause mortality and the morbidity of the disease is unknown. A review of the literature suggests statistics on race for TSPK are currently unknown. TSPK has a slight female predilection. Due to the chronic nature of the disease, with exacerbations and remissions, patients need to be educated that their symptoms may recur no matter which course of therapy is followed. Patients on topical steroids need routine follow-up examinations. Thygeson P. Superficial punctate keratitis. J Am Med Assoc. 1950 Dec 30. 144(18):1544-9. [Medline]. Tabbara KF, Ostler HB, Dawson C, Oh J. Thygeson's superficial punctate keratitis. Ophthalmology. 1981 Jan. 88(1):75-7. [Medline]. Nagra PK, Rapuano CJ, Cohen EJ, Laibson PR. Thygeson's superficial punctate keratitis: ten years' experience. Ophthalmology. 2004 Jan. 111(1):34-7. [Medline]. Thygeson P. Clinical and laboratory observations on superficial punctate keratitis. Am J Ophthalmol. 1966 May. 61(5 Pt 2):1344-9. [Medline]. Darrell RW. Thygeson's superficial punctate keratitis: natural history and association with HLA DR3. Trans Am Ophthalmol Soc. 1981. 79:486-516. [Medline]. Jones BR. Thygeson's Superficial Punctate Keratitis. Trans Ophthalmol Soc U K. 1963. 83:245-53. [Medline]. Arffa RC. Grayson's Diseases of the Cornea. 4th ed. St. Louis: Mosby-Year Book; 1997. Tantum LA. Superficial punctate keratitis of Thygeson. J Am Optom Assoc. 1982 Dec. 53(12):985-6. [Medline]. Lemp MA, Chambers RW Jr, Lundy J. Viral isolate in superficial punctate keratitis. Arch Ophthalmol. 1974 Jan. 91(1):8-10. [Medline]. Braley AE, Alexander RC. Superficial punctate keratitis; isolation of a virus. AMA Arch Ophthalmol. 1953 Aug. 50(2):147-54. [Medline]. Reinhard T, Roggendorf M, Fengler I, Sundmacher R. PCR for varicella zoster virus genome negative in corneal epithelial cells of patients with Thygeson's superficial punctate keratitis. Eye. 2004 Mar. 18(3):304-5. [Medline]. Reinhard T, Sundmacher R. Topical cyclosporin A in Thygeson's superficial punctate keratitis. Graefes Arch Clin Exp Ophthalmol. 1999 Feb. 237(2):109-12. [Medline]. Connell PP, O'Reilly J, Coughlan S, Collum LM, Power WJ. The role of common viral ocular pathogens in Thygeson's superficial punctate keratitis. Br J Ophthalmol. 2007 Aug. 91(8):1038-41. [Medline]. Cheng LL, Young AL, Wong AK, Law RW, Lam DS. In vivo confocal microscopy of Thygeson's superficial punctate keratitis. Clin Experiment Ophthalmol. 2004 Jun. 32(3):325-7. [Medline]. Watson SL, Hollingsworth J, Tullo AB. Confocal microscopy of Thygeson's superficial punctate keratopathy. Cornea. 2003 May. 22(4):294-9. [Medline]. Kobayashi A, Yokogawa H, Sugiyama K. In vivo laser confocal microscopy findings of Thygeson superficial punctate keratitis. Cornea. 2011 Jun. 30(6):675-80. [Medline]. Tanzer DJ, Smith RE. Superficial punctate keratitis of thygeson: the longest course on record?. Cornea. 1999 Nov. 18(6):729-30. [Medline]. Nesburn AB, Lowe GH 3rd, Lepoff NJ, Maguen E. Effect of topical trifluridine on Thygeson's superficial punctate keratitis. Ophthalmology. 1984 Oct. 91(10):1188-92. [Medline]. Fintelmann RE, Vastine DW, Bloomer MM, Margolis TP. Thygeson Superficial Punctate Keratitis and Scarring. Cornea. 2012 Apr 10. [Medline]. Gock G, Ong K, McClellan K. A classical case of Thygeson's superficial punctate keratitis. Aust N Z J Ophthalmol. 1995 Feb. 23(1):76-7. [Medline]. Del Castillo JM, Del Castillo JB, Garcia-Sanchez J. Effect of topical cyclosporin A on Thygeson's superficial punctate keratitis. Doc Ophthalmol. 1996-1997. 93(3):193-8. [Medline]. Hasanreisoglu M, Avisar R. Long-term topical cyclosporin A therapy in Thygeson's superficial punctate keratitis: a case report. Cases J. 2008 Dec 23. 1(1):415. [Medline]. Forstot SL, Binder PS. Treatment of Thygeson's superficial punctate keratopathy with soft contact lenses. Am J Ophthalmol. 1979 Aug. 88(2):186-9. [Medline]. Goldberg DB, Schanzlin DJ, Brown SI. Management of Thygeson's superficial punctate keratitis. Am J Ophthalmol. 1980 Jan. 89(1):22-4. [Medline]. Jabbur NS, O'Brien TP. Recurrence of keratitis after excimer laser keratectomy. J Cataract Refract Surg. 2003 Jan. 29(1):198-201. [Medline]. Seo KY, Lee JB, Jun RM, Kim EK. Recurrence of Thygeson's superficial punctate keratitis after photorefractive keratectomy. Cornea. 2002 Oct. 21(7):736-7; author reply 737. [Medline]. Netto MV, Chalita MR, Krueger RR. Thygeson's superficial punctate keratitis recurrence after laser in situ keratomileusis. Am J Ophthalmol. 2004 Sep. 138(3):507-8. [Medline]. Fite SW, Chodosh J. Photorefractive keratectomy for myopia in the setting of Thygeson's superficial punctate keratitis. Cornea. 2001 May. 20(4):425-6. [Medline].